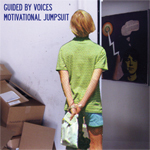 Motivational Jumpsuit is the latest, bestest release by reunited indie rock (whatever that means) juggernaut (means an unstoppable force) Guided By Voices. It speaks in several silvery tongues, and like last year's English Little League takes many routes to the same shimmery, elusive destination: rock greatness. Its 20 songs (in 38 minutes!) range from the shaggy, Who Sell Out pop-pourri of "Evangeline Dandelion" to the lurching, rifferific "Planet Score," breezing briskly through every worthwhile rock 'n' roll style sheet along the way. Robert Pollard and co.'s influences are by now so thoroughly assimilated that Guided By voices referents are mostly to other Guided By Voices songs / eras: "Save the Company" calls to mind the band's Bee Thousand / Alien Lanes lo-fi glory daze, while "Vote for Me Dummy" could be from Isolation Drills. For instance. Recent intramural turmoil aside (Guided By Voices has a long history of members quitting / getting fired / posting private correspondence online / waking up in the gutter), the band has never sounded more cohesive. Tobin Sprout's insanely catchy feather-light confection "Record Level Love" bobs up against the deeply purple spray-paint rock of "I Am Columbus," which pinballs into the elastic, sprightly "Difficult Outburst and Breakthrough"�the pacing and variety always seem to make some kind of higher sense, if only as an appeal to the senses. Motivational Jumpsuit is gangly, wordy, heavy, lovely, catchy, rocky, complexly simple, and better than almost any record you'll hear this year. This is the fifth record (in three years) by New Era GBV, and there will be more. Listeners may be forgiven a certain degree of bewilderment at the sound feast spread before them, but rest assured, this is the result of hard labor by a restlessly inventive musical mastermind. You can dig in anywhere you like, but you will always come back for more. Like a star to every wandering bark, Guided By Voices is as constant as love. You can�t say better than that.